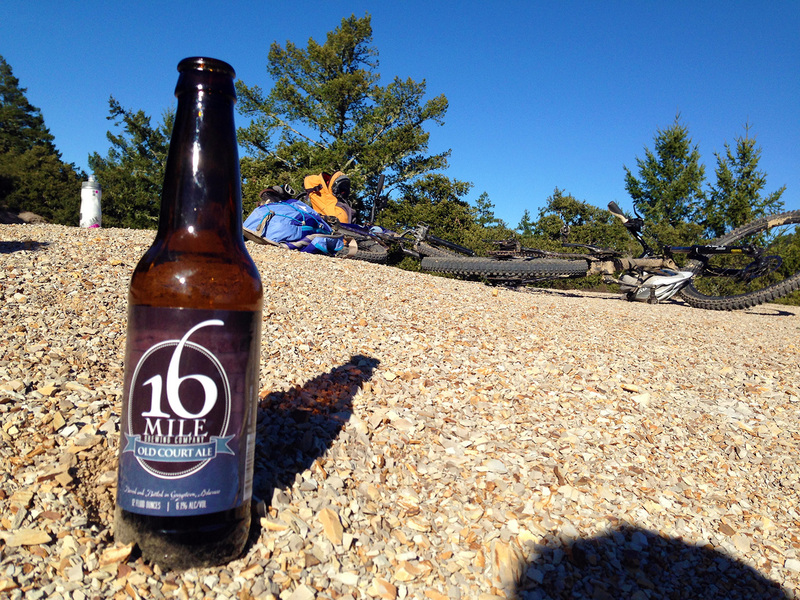 It’s been a while since Mountainbeering has done some mountain biking, so a 28 mile ride through Big Basin Redwoods State Park seemed like the smart thing to do. Bikes aren’t allowed on the hiking trails, but there are a ton of old forest roads to explore. Overall, this was a really fun ride that passed through lots of different microclimates and provided a few great views. It got to be very strenuous in parts because of the length and steep hills, but was never overly technical. 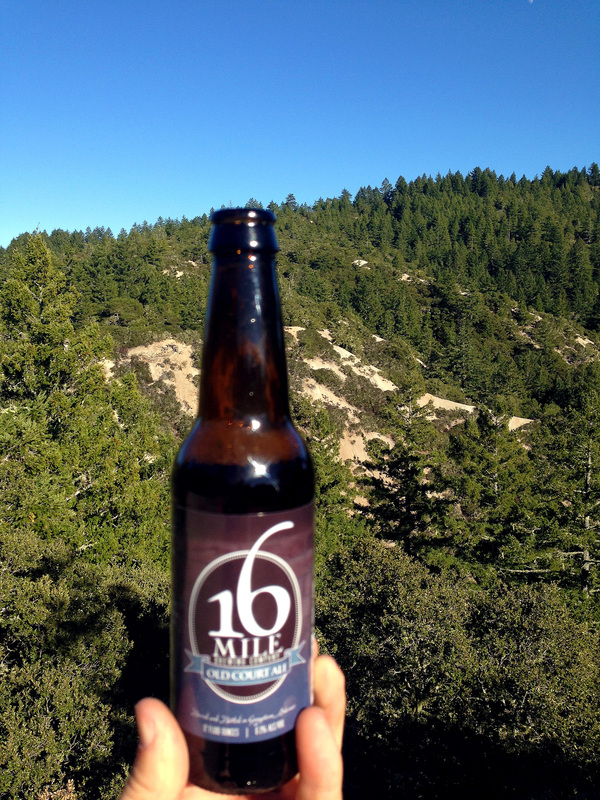 Thanks to an amazing beer of the month club Christmas gift, we enjoyed a 16 Mile Brewery Old Court Ale which is a dark pale ale. I just can’t get enough of dark ales these days! And this one did not disappoint. It was light, crisp, hoppy, citrusy, and held up well considering it had been warming up in my backpack for the past 3 hours. I also enjoyed having my first beer from a Delaware Brewery that isn’t Dogfish Head. Why are there train cars and awesome tree houses out here? I have no idea, but I approve. 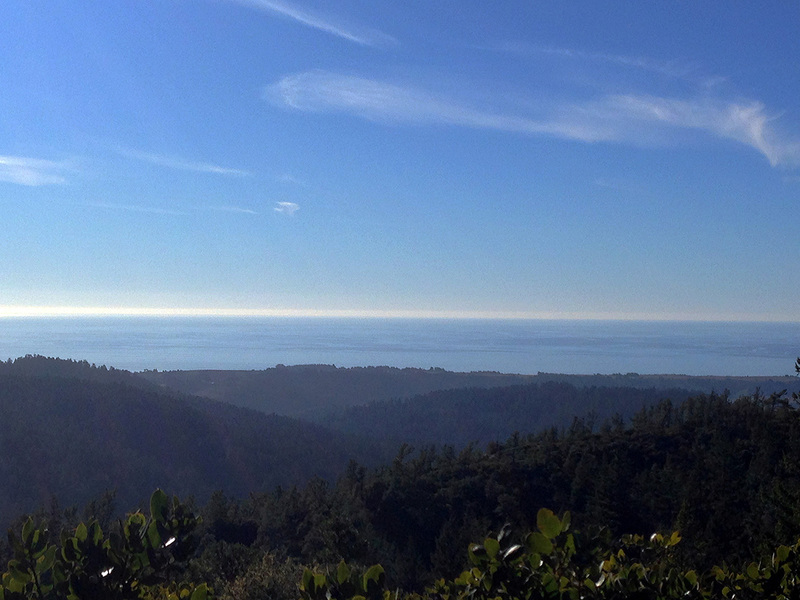 The ride starts deep in the chill and shade of majestic redwoods at Big Basin Park Headquarters. Follow the signs towards “additional parking”, and after a few hundred feet, turn left and cross a bridge. You are now on Gazos Creek Rd. The trail is mostly uphill with a few downhill sections for the next ~6.5 miles. Here, you come across a quirky intersection at Sandy Point. 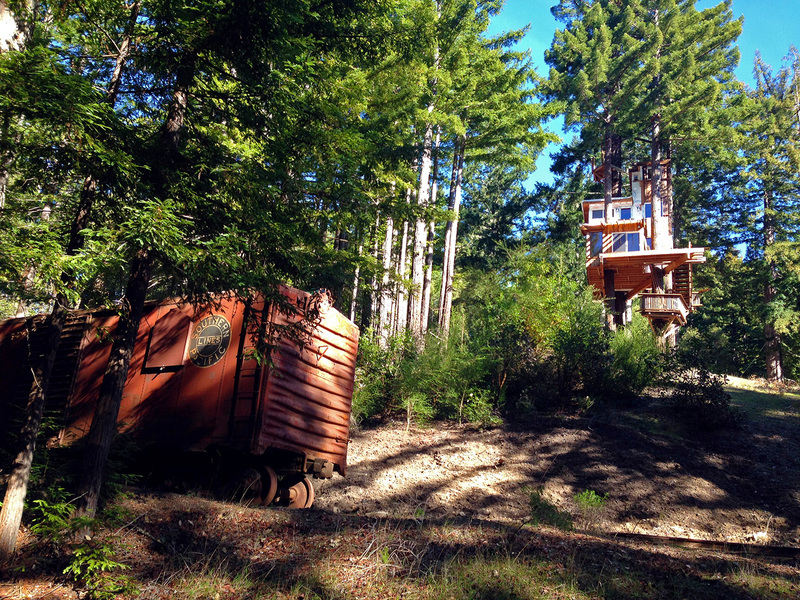 You’ll know you’re there because of the elaborate tree house and railroad cars (pictured above). For the next ~5 miles, continue on Gazos Creek Rd which turns into a very steep rutted downhill (probably some of my favorite riding here), then mellows out to a paved road that follows the actual Gazos Creek. Take a right at Cloverdale Rd and follow it for the next ~2.1 miles. This is a warm, easy-going stretch in chaparral, and you’re close enough to the ocean that you can hear the waves crashing in the distance. It’s also the lowest point in elevation of this ride, expect a lot of uphill from here. While on Cloverdale Rd, you’ll pass the Butano State Park entrance and about 1 mile later turn right through a gate onto Butano Fire Trail. There’s going to be a lot of steady climbing for the next ~10 miles, but there are some highlights and gorgeous views along the way. Including a cool old air strip that you ride across. The next turn to take is a right onto Johansen Rd which is well marked and near the pinnacle of the climb. Now things get fun as it’s mostly downhill. Stay on Johansen Rd for a short time (~.7 miles), then veer left to stay on Middle Ridge Rd. After ~2 miles, you’ll come across a gate which is Gazos Creed Rd. From here turn left and it’s a quick ride back to the parking lot. 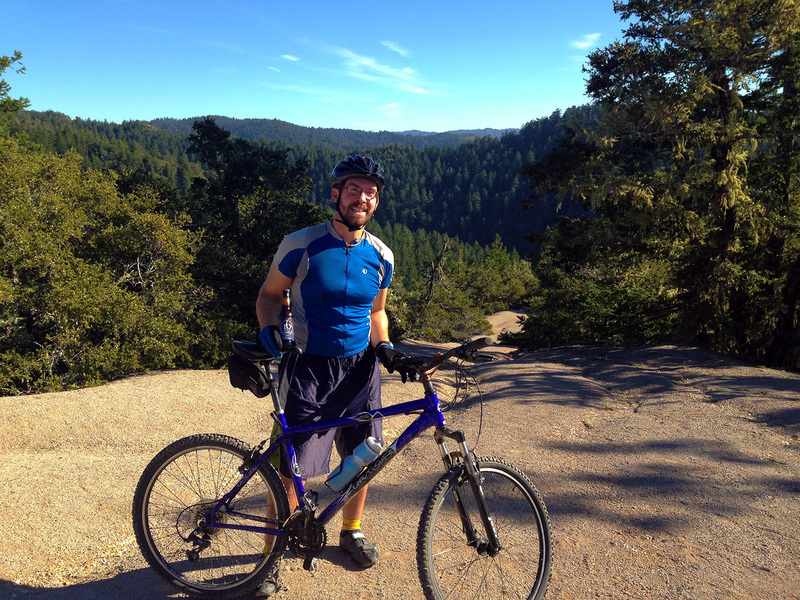 Have you been on any good rides in the Santa Cruz Mountains? I’m always looking for more places to ride. Posted in Beer, Entertainment, Outdoor fun, The Americas Adventures, Uncategorized, USA AdventuresTagged 16 mile, 16 mile brewery, adventure, bay area, beer, big basin, big basin redwoods state park, big basing state park, bike ride, bikes, brewery, epic, mountain, mountain beering, mountain bike, mountain biking, mountainbeer, Mountainbeering, old court ale, outdoor, outside, santa cruz mountains, state parkBookmark the permalink. I backpacked up to the old airstrip in Butano Park a couple of times in the 90s. I remember seeing a mountain biker coming up the fire road and thinking man, that looks hard. Since then I took up mountain biking myself and wondered about doing the loop you described. I thought the connection between Butano and Gazos Creek didn’t allow bikes (not that they enforce it). Did you see any signs? I didn’t run into that problem or see any signs posted. I know that bikes are not allowed on hiking trails in Big Basin or Butano, but if it’s a fire road, then it’s fair game! Yeah, fire roads are cool for bikes in both State Parks. The question was whether there was a stretch of fire road between the two parks that’s private and illegal for bikes. But if you didn’t see any signs, then either that’s not true or they’re not actually enforcing it. Sometimes land owners don’t care that much, but they don’t want to make it officially legal because they don’t want to be bound to provide access in the future. Ah, yes. You’re right. I believe there are some private roads, and they have “private land” posted, but nothing about no trespassing or not using the roads. I think there’s a friendly, “Don’t mess it up, and you can use it,” understanding going on.